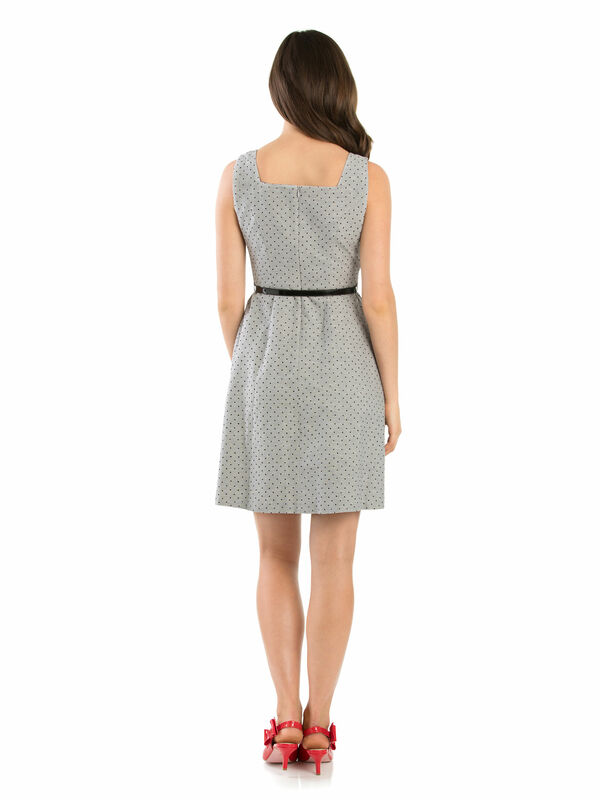 Amelie Dress https://www.review-australia.com/au/amelie-dress-charcoal-black/RE19DR365.REBLK050.html Polkadot prints will add a fun refresh to a classic look with this Amelie Dress. Fitted with double breasted buttons on the chest, chic black piping, and a hidden zip on the back for a seamless finish. The dress boasts a pleated A-line skirt and it comes with a removable black skinny belt. Perfect for work events or evenings out. 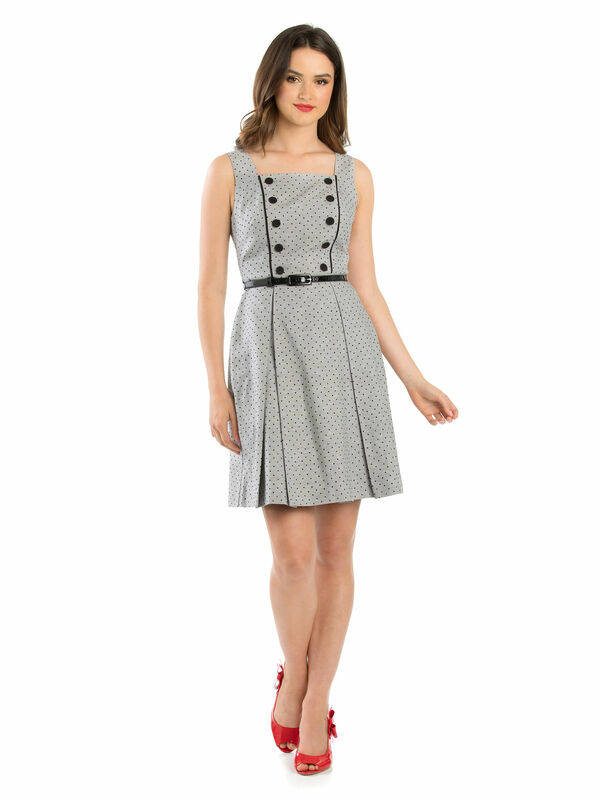 Polkadot prints will add a fun refresh to a classic look with this Amelie Dress. Fitted with double breasted buttons on the chest, chic black piping, and a hidden zip on the back for a seamless finish. The dress boasts a pleated A-line skirt and it comes with a removable black skinny belt. Perfect for work events or evenings out. Amelie Dress is rated 4.8 out of 5 by 21. Rated 5 out of 5 by aidanadia29 from Looking fine at work Bought this dress a couple of weeks ago and can’t get enough of it. Absolutely gorgeous. Comes in a light grey so it’s not too flashy, but the pleated skirt gives me a silhouette I don’t really have! I can pair it with a small waist coat and heels for work, and dress it down for dinner. The fit is true to form - I am a size 10 and it fit me like a glove. Length of dress is good as well - just above the knee showing just enough leg to be coy, not so long that you look like a nun. Fits well around the bust. Neckline not too high, not too low - just right. Works with or without the belt. Fabric is light enough for this warm weather but also thick enough that it will be great for autumn/winter paired with stockings. Really happy with the purchase, definitely recommend. Rated 5 out of 5 by chichi from Elegant dress for summer and winter I bought this dress last week and wore it for work. The colour and design is conservative enough for the office and the button and piping and small dot details makes it fun. I can imagine wearing this in winter with a button down collar shirt underneath. This is indeed another item in my wardrobe that won't go out of style. The shoulder straps are also wide and short enough to sit nicely on a short person - like myself - I'm only 5 foot. Rated 5 out of 5 by MissT_212 from Absolutely gorgeous I brought this dress for an interview and, omg, I'm so glad I did! With a chessie cardi and some cute heels, it was a total power outfit. The dress is extremely lightweight, required no ironing (praise the gods!!!) and fit like a glove on my extreme hourglass figure. It's the perfect corporate dress, 11/10 would recommend!!! Rated 5 out of 5 by NIREE from Versitile and femanine A very sweet Dress. I wear with Cardie or as Pinny. I am of mature age but find Review Clothing adapts to all ages a wonderful feeling. Sorry I am not good with technology.Former Art Teacher and love your designs.....Thank you Review !!! Rated 4 out of 5 by Jacks from Great dress I love the dress, wore it out last night to dinner and the theatre. However, I suggest that you check the buttons are secure before wearing it out, as a person brushed past me last night and one of the buttons fell off. I am going to sew them all on tightly. Rated 5 out of 5 by PrincessFifi from Mod Chic! Absolutely love this dress, so comfy and versatile! Will be wearable throughout the year, great mod style! Love the Linen/Cotton blend, if only the lining was cotton too! Sizing is as per Review standard, length is great, even for me (1.65cm)! Rated 5 out of 5 by Adriana Nascimento from Perfect fit - great quality This dress is very versatile it can be used in the office or out and about. Fits perfectly and as all Review products it’s great quality. I’m looking forward for winter to be able to wear it with a nice coat and boots. Rated 5 out of 5 by Eniale117 from Professional and elegant I bought this dress on the first week when it first came out and it was love at first sight. I tried it on and it was so comfortable. I can wear it for work and outside of work. Just love it!